Boot liners for the Jaguar S-Type are the ideal accesory to keep your boot clean from spillages. 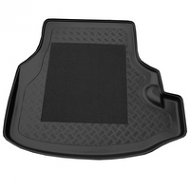 All Jaguar bootliners come with an antislip centre. Fully washable and made from a tough flexible plastic.